The Sandalwood City, for many, is where myths and images from the past meet the reality of a city trying to claw its way out of the mud of poverty and into the economic sunshine of a capitalist world. French echoes of Indochina; drugs, spies and violence of the Vietnam War era; and the silent, closed years of communist horrors  a history jarring oddly with the commercial centre and the leafy hideaways in the outer ring of development. But romantic, nonetheless, for travellers who can linger, trying to peer into the past to place the present and guess at the future of a country emerging into a new world. By day, the city can be noisy and polluted as the traffic pounds the streets. But in the evening, once the day's work is over for most people, there is a calm, quiet charm ... a time to amble along the path overlooking the Mekong, stepping aside for home-going cattle, and maybe eat in the open-air restaurants that flower in the soft shards of the dying sun on the water. It is a city of interesting and beautiful corners rather than grand elegance. 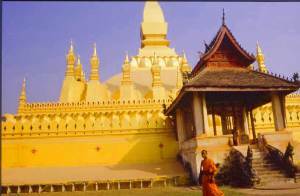 Easily the most spectacular is Pha That Luang (picture above), the great stupa, that is the foremost Buddhist monument in Laos and features as part of the national emblem. But others, like the city's Wat Simuang, and the forest temple of Wat Sok Pa Luang with its herbal saunas and monks and novices arriving in jumbos for school, have a quiet charm that relax the mind and enrich the spirit. And still others, like That Dam  the Black Stupa  focus the mind: here, according to local legend, a dragon lives below the ground and it will rise up to protect the people as it did when the Siamese invaded in 1828. Maybe no one actually believes it but, like the story of the naga's protection of Buddha, who would completely deny it? In November, Pha That Luang heaves with monks and laity during the annual festival of merit making. But at other times, there can be a quiet serenity with almost no one apart from monks and the occasional falang. The great stupa was first built in 1566 and in 1828 it was deserted as the local people fled the killing of the Siamese invaders. It entered Western consciousness when it was 'discovered' , decaying and overgrown, by the French explorer Louis Delaporte in 1900. The French, newly the colonial masters, tried to restore it but the result was poor and they worked on it again, using DelaporteÕs drawings, in 1933. The structure encodes the Buddhist doctrine, with ascending levels where the faithful can walk to contemplate the meaning of Buddha's teachings. On the way from the city centre to Pha That Luang, you can see Patuxia  a huge structure that, from a distance, makes you think of the Arc de Triomphe but, on closer inspection, is decorated with wild Lao designs. This is a "forest temple" but the expanding urbanisation has swallowed the wat and its ground. It is still pleasantly treed, with a temple, several halls, a school for monks and its famous sauna hut, but around it are homes and roads. You can wandered through the wat, enjoying the Buddhist murals and photographing monks arriving by jumbo for their classes, before reaching the temple. A young novice greeted us and invited us into the temple. We sat in front of the Buddha image and, after a little, he offered us fortune-telling sticks. All the while, huge ants trekked across the floor, going around and over us. The noviceÕs eyes were sparkling as he watched us. "Do these ants bite?" "Oh, yes ..." he replied, beaming. Another young novice, Boun, welcomed us to Wat Simuang. It is the most popular wat in the city and the highlight of the Pha That Luang festival is a procession from there to Wat Simuang. By chance, we went there on the day for making merit and local people were taking flowers, fruit, candles and incense. A little girl offered small cages, each containing a bird which was released after payment  a kindness that makes merit, though the birds fly home and the process starts again. It is the temple where local people go to make wishes. If the wishes are granted, they must return with coconuts and other traditional temple gifts. As we sat in the temple grounds, drinking the milk of fresh coconuts prepared by Boun, we wished to return with out own offerings: the wish fulfilled and the offerings as one.